Happy August! July was productive, fun, stressful, and overall really positive. I’m excited to see what August has in store! 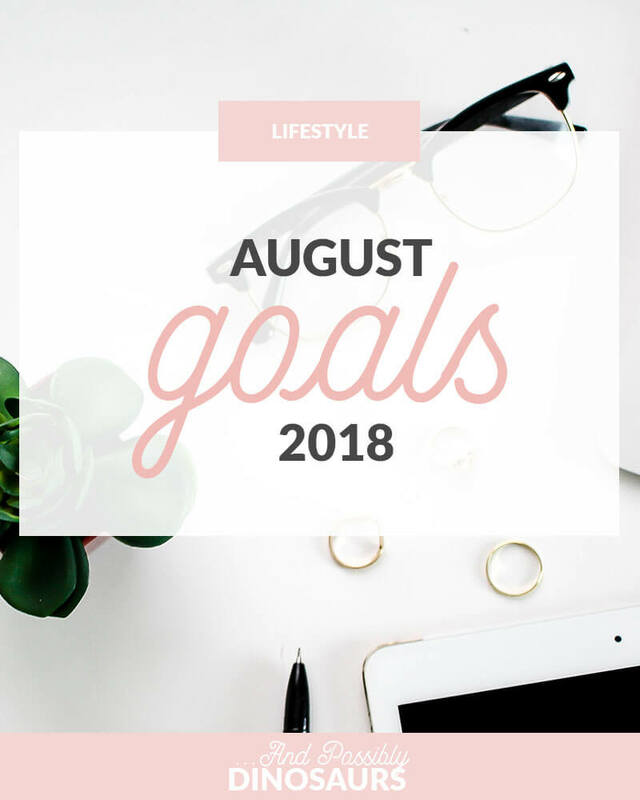 But first, let’s do a recap of my goals for the month of July. Clean out my Kindle of books I’ll never read. ✔ I ended up cranking this out on July 1, and I’m so glad I did. I had a ton of free ebooks from various email lists that I literally only downloaded because they were free. Originally I thought I’d go through them and see which ones sounded good enough to keep. Instead I went through and saved the ones I recognized, and deleted the rest. It was so freeing! Begin Couch to 10k and run 3x per week. ✔ I technically didn’t run 3x every week, but I’m okay with that! I’m not doing the program verbatim so I can progress at my own pace. For example, this week I’m going through last week’s runs a second time, because last week I couldn’t quite finish them. And that’s okay! I’m still making progress. Listen to 50 episodes of the Happier Podcast. ✔ Technically, yes! I didn’t get to Episode 100, like I wanted, but I listed to more than 75 episodes. There are a ton of “Little” episodes between each full episode, so when those are factored in, I listened to way more than 50 episodes of the Podcast. Plus, I’m driving all the way to Dayton, Ohio today and back to Kalamazoo tomorrow, so I’ll have plenty of podcast-listening time on my hands. Stick to my regular posting schedule of 3 blog posts and 1 newsletter per week. ✔ For the most part! I decided at the end of the month that I’m changing up my regular posting schedule, so this became a little bit of a moot point. I’m now doing two blog posts per week (Sunday Scratches and a blog post on blogging, design, or career), and if I want to throw in a lifestyle blog post, it will be blog post #3 for the week. That means I’ll have more time for other projects for the blog! Post to Instagram 5 times per week. ✘ I was a bit too ambitious when I set this goal. Instagram just fell by the wayside while I worked on writing, running, listening to podcasts, and rebranding. Completely finish the And Possibly Dinosaurs rebrand. ✔ Ugh, FINALLY. I’ve been working on this for what feels like forever (literally at least a year), and I finally sat down and got it cranked out. It makes me so happy! Five out of six isn’t too bad! I’m really proud of myself, because I was not very optimistic I’d get this many accomplished. Now let’s see what I have planned for August. Read 3 books. I’m a bit behind on my reading goal. My Goodreads reading challenge technically says I’m on track, but that’s because it’s including some books that I started and couldn’t finish, so it’s a little skewed. I’m going to be ambitious this month and try to read and finish 3 books! Continue Couch to 10k and run 3x per week. I’ve been enjoying my running routine (who am I? ), so I want to keep it going! I know I’m going to have to repeat some weeks if I’m not quite ready to move on with them, and that’s okay. I just want to keep consistently running 3x per week with the help of Couch to 10k. Find out my blood type. It really bothers me that I don’t know my blood type. Unfortunately, I’ve been told many times that the best way to find out my blood type is by donating blood… and I tend to pass out whenever I have my blood drawn. Luckily it also bothers Sean that we don’t know my blood type, so I’ve told him that I’m going to donate blood this month and he has to drive me in case I pass out. Wish me luck! Clean up my To Sort folder on my computer. This is similar to the Kindle project that I undertook in July. I used to have the terrible habit of downloading all of the Creative Market Free Goods each week, which just littered up my To Sort / Downloads folder on my computer (I renamed my Downloads folder in an attempt to be more organized). Now I want to go scorched-earth on it and just delete all of it, but I know there are some things in there that I need. Yay for a new organization project for the month! Create and publish one ebook. I’ve been really wanting to create and publish my own ebook, mostly as a way to practice creating long-form documents in InDesign. I’m challenging myself (and I really mean challenging myself) to create and publish my very own ebook this month. I don’t know if it will be a free download or for purchase yet… we’ll see what I come up with! Go through 3 classes in CoSchedule Academy Pro. I recently got free one-year access to CoSchedule Academy Pro, and I don’t want to let a year go by without taking advantage of it! It’s a bundle of 15 courses, so this month I want to go through 3 of them. They all seem pretty small and hyper-focused, so I’m excited about cranking out some learning and planning! Whew! I’m being really ambitious this month, with 6 goals, some of which are quite large. Wish me luck!